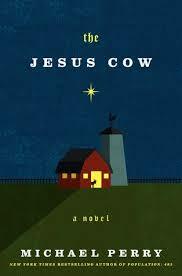 a book chick: "The Jesus Cow"
my take: Literature can take you anywhere; I do love reading about all kinds of places. As a midwest girl born and bred, there's something particularly homey and wonderful about midwestern writing. Although not a farm girl (by any means) nor a small-town gal, I loved the farmer, Harley, and rural Swivel's inhabitants. Harley has a few beefers and a milker on what's left of his father's farm. On Christmas Eve his milker gives birth to a calf with the face of Jesus on its hide. Enter a the wise veteran, a biker girl friend, and a blabber-mouth mail lady and his quiet solitary life is over. The story is fun, low-key, easy and could be taken just as a nice beach read ... and the thoughts are deep and deserving of inspection and reflection if you've got the time and energy. Michael Perry brings us the intersection of religious belief with the practical, gritty real world. Deep thoughts, beautifully crafted language, and earthy characters in a wonderful conglomeration of Michael Perry's life and interests. Even though I could see how some of the plot was gonna play out and the last chapter was more of an epilogue, I loved this. my source: Spotted this hardcover for $7 at the wonderfully fabulous Unabridged Bookstore on Broadway in north Chicago. If you are in the area: GO. Also, a huge Michael Perry fan. Also read: Population 485, Coop, Truck: A Love Story to get to know him. my verdict: Very good feel good. And just what I needed. Looking forward to taking my turn with this one at the beach!